If you’re familiar with our site and products, then you know StickerYou.com is a great place to make sheets of labels and stickers. What you may not know is that you can completely customize your own pages. This means you can have custom sticker pages or custom temporary tattoo pages full of completely different, design, shape and size. Allow us to introduce you to our PageMaker Classic! Part of our online platform, the PageMaker Classic allows for full customization of your sticker pages. You can choose from a variety of templates or start with a blank sheet. From there you have the options to choose artwork from our extensive online gallery of stickers, all conveniently sorted by themes, or you can click “New Sticker” to use our colour palette, text tools and patterns and shapes to create your own. Have your own images you want to make stickers of? No problem- just click the upload button to add the images to your own personal album, then drag and drop into place on the sticker page. Use the arrow tools in the corner of each sticker to re-size and adjust stickers and drag them around the page to fit. You can also use PageMaker Classic to design your own custom temporary tattoo pages! Make tattoos for every part of your body on one single page. Fast, easy and inexpensive. Moms! Making labels for your kids but don’t want to buy two different sheets? The PageMaker Classic will allow you to place multiple designs on one sheet, saving space and money. Choose a label template and then design each sticker however you like. Quickly fill a page by selecting one design on the sticker page, then “copy”, “paste” and choose how many times to repeat the sticker. Guys and Girls! Add a personal touch to those gifts by making custom stickers for your buds and besties. They will love their personalized sticker pages. The PageMaker Classic is a fun and affordable way to make your own stickers your way and just as we promised; any shape, any size and any quantity. You can even re-print past pages as all previous pages you ordered are added to your own online album. You can access them, edit them, and reprint them at any time. 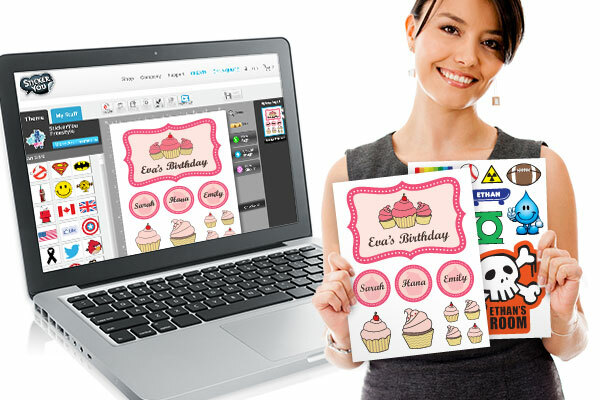 To get started simply create an account or login to your existing account on StickerYou.com. Click the blue “Create Now” button on the homepage and then choose PageMaker Classic. Get creative and Make It Stick!